Did you know customers are measuring how much it costs to do business with you? It’s called Cost per Invoice (CPI). Accounts payable (AP) uses the metric to determine how well they are performing. It’s calculated by taking the total monthly expense incurred by AP and dividing by the number of invoices. This metric can also be computed against a subset of invoices to determine cost variances from one group to another. In other words, your customers’ AP can see how much your invoices cost to process. A high CPI is a sign of inefficiencies within an AP Department including overly manual invoicing steps or a significant number of disputes to resolve. So how expensive is it to do business with you? Here’s the math. 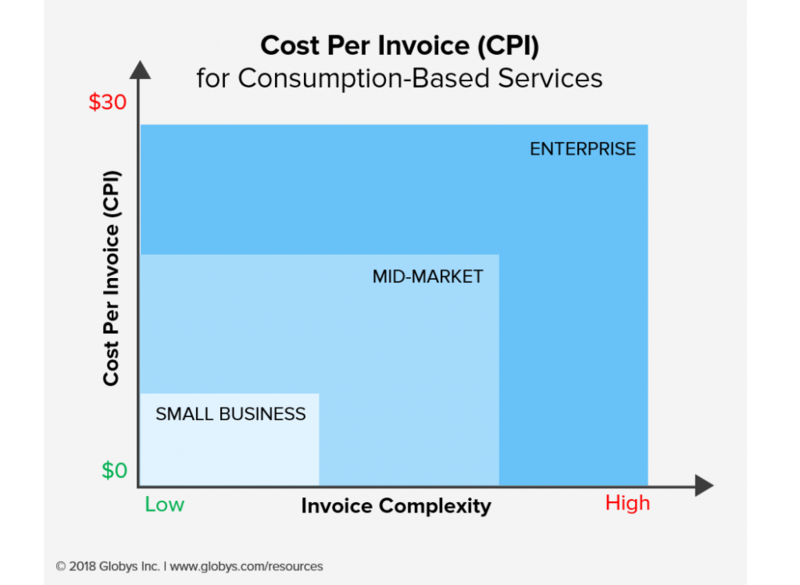 The CPI for business customers to process a consumption-based invoice ranges from $4 to $26. These ranges are a bit higher than other CPI benchmarks due to the complexity in receiving and reviewing usage and fee data. Research also shows consumption-based billers, such as telecommunications and utilities, are lagging behind with e-invoicing solutions. This means business customers are using offline methods to re-key invoice data from paper bills into their AP systems. For small business customers, who are likely receiving one to ten fairly straight forward invoices per month, the total monthly cost is $40 or less. But for enterprise customers, the costs can be staggering. It’s not uncommon for these large corporate or commercial accounts to receive upwards of 500 invoices from a single provider (think invoicing per site or service). This brings the total monthly cost of invoice processing to more than $10,000! So no, you’re not charging your customers a $10k monthly fee, but yes it costs them that much to process your invoices. Just how much it costs depends on the billing experience you provide. Do you give them the tools to quickly and efficiently validate and pay? Or do you make them do it offline with Excel? And it doesn’t just cost your customer. It costs you too. It’s no secret that billing and disputes remains one of the top call drivers among all business segments. Every call they make and every day they wait is increasing their CPI and your support costs. Research shows it can take up to 12 days to process an invoice. This isn’t due to lack of effort. It’s the manual steps required to align your invoice with their processing and payment structures. And every day that passes, your DSO increases. And what about the impact to customer satisfaction? The billing experience ranks as the top reason for customer dissatisfaction and ultimately, the search for another provider. Businesses large and small are investing in Accounts Payable technologies to remove the manual invoice processing that is costing them time and money. But internal enhancements can only improve CPI by so much. They’re depending on you, their service provider, to provide them with the billing experience required to transition to a state of automation. See how suppliers are using Globys Invoicing & Payments to provide a billing experience that simplifies the invoice process for their business customers.